Hyatt Regency Johannesburg, 191 Oxford Rd, Rosebank, Johannesburg, 2196, South Africa. Microservice architecture is often misunderstood and misread. The architecture promotes lightweight edge gateways and proxy processors. This very fact is misunderstood as a replacement for an API Management layer, which focuses a lot more on quality of services such as life-cycle management, fine-grained security, throttling and a developer enablement portal. During this meetup, we will discuss, the place of API Management in a microservices ecosystem. We will discuss the purpose of edge gateways and proxies and how that complements a well defined API Management layer. Nadeesha is a Senior Lead - Solutions Engineer at WSO2 and is part of the Solutions Architecture team. In his role Nadeesha has worked with customers from multiple domains to build robust and scalable solutions. Nadeesha also plays the role of a technical owner for many WSO2 customers to provide advice and guidance on their IT roadmap. Nadeesha has a Bachelors degree in Computer Science and Management Studies from the University of Nottingham, UK, and a Masters in Business Administration from the University of West London, UK. Nadeesha is also an exam passed finalist of Chartered Institute of Management Accountants (CIMA). 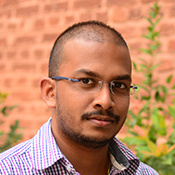 He has over 9 years of experience in the IT industry, of which 5 years have been at WSO2.